I use an USB-WDE1 receiver from ELV to collect temperature and humidity data from thermometers distributed all around the house. 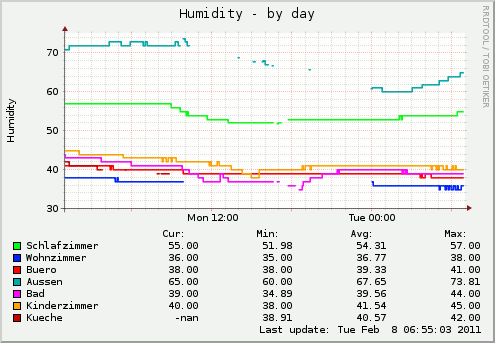 To make use of them, I created a Munin plugin that simply reports the temperature and humidity to munin, which in turn draws nice graphs. 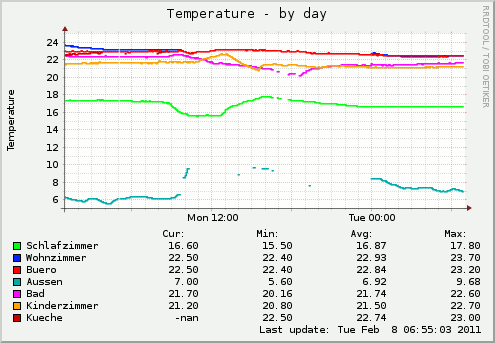 The munin plugin supports up to 8 sensors, allows to configure custom sensor names (i.e. "Kitchen" or "Basement") and global warning and critical settings as well as per-sensor warning/critical settings. once. It backgrounds the logging process and logs into /tmp/usb-wde1-last. This process needs to be started whenever the machine is rebooted. You may run make to install the init script. You are done - enjoy.